TALC, ZINC STEARATE, SILICA, POLYETHYLENE, ISONONYL ISONONANOATE, ZEA MAYS (CORN) STARCH, MICA, DIMETHICONE, CAPRYLYL METHICONE, ZEOLITE, METHYLPARABEN, SORBIC ACID, DIMETHICONOL, TETRASODIUM EDTA, PROPYLPARABEN, BUTYLPARABEN, BHT, TRIMETHYLSILOXYSILICATE, IRON OXIDES (CI 77491, CI 77492, CI 77499). TALC, DIMETHICONE, OCTYLDODECYL STEAROYL STEARATE, ZINC STEARATE, ZEA MAYS (CORN) STARCH, SILICA, PENTAERYTHRITYL TETRAISOSTEARATE, POTASSIUM SORBATE, CHLORPHENESIN, CALCIUM ALUMINUM BOROSILICATE, TETRASODIUM EDTA, TIN OXIDE, IRON OXIDES (CI 77491, CI 77492, CI 77499), TITANIUM DIOXIDE (CI 77891). TALC, ZINC STEARATE, DIMETHICONE, ZEA MAYS (CORN) STARCH, SILICA, PENTAERYTHRITYL TETRAISOSTEARATE, OCTYLDODECYL STEAROYL STEARATE, POTASSIUM SORBATE, CHLORPHENESIN, TETRASODIUM EDTA, IRON OXIDES (CI 77491, CI 77492, CI 77499), ULTRAMARINES (CI 77007). TALC, MICA, ORYZA SATIVA (RICE) STARCH, ISONONYL ISONONANOATE, DIMETHICONE, ZEA MAYS (CORN) STARCH, ZINC STEARATE, CAPRYLYL GLYCOL, OCTYLDODECYL STEAROYL STEARATE, PHENOXYETHANOL, DIMETHICONOL, HEXYLENE GLYCOL, POLYMETHYLSILSESQUIOXANE, SILICA,TIN OXIDE, TRIMETHYLSILOXYSILICATE, IRON OXIDES (CI 77491, CI 77492, CI 77499), TITANIUM DIOXIDE (CI 77891). TALC, MICA, ORYZA SATIVA (RICE) STARCH, ISONONYL ISONONANOATE, DIMETHICONE, OCTYLDODECYL STEAROYL STEARATE, ZINC STEARATE, ZEA MAYS (CORN) STARCH, CAPRYLYL GLYCOL, PHENOXYETHANOL, DIMETHICONOL, HEXYLENE GLYCOL, POLYMETHYLSILSESQUIOXANE, SILICA, TRIMETHYLSILOXYSILICATE, TIN OXIDE, [MAY CONTAIN (+/-): IRON OXIDES (CI 77491, CI 77492, CI 44799), TITANIUM DIOXIDE (CI 77891), RED 7 LAKE, RED 6 (CI 15850), CARMINE (CI 75470)]. TALC, MICA, ISONONYL ISONONANOATE, ORYZA SATIVA (RICE) STARCH, DIMETHICONE, ZEA MAYS (CORN) STARCH, ZINC STEARATE, CAPRYLYL GLYCOL, PHENOXYETHANOL, DIMETHICONOL, HEXYLENE GLYCOL, POLYMETHYLSILSESQUIOXANE, TIN OXIDE, SILICA, TRIMETHYLSILOXYSILICATE, TITANIUM DIOXIDE (CI 77891), IRON OXIDES (CI 77491, CI 77492, CI 77499). You’re seconds away from a smoky eye. Discover Charlotte’s smoky eye secrets in one clever palette. Smokey Eye Beauty comes with everything you need to create a smoldering smoky eye in a snap. Never-before-seen shades meet cult classics—like Charlotte’s beloved Bar of Gold highlighter—for a mesmerizing look that you can dial up or down for any occasion. Create a smoky eye in a snap. Simply follow the foolproof color-by-numbers design to achieve a sculpted smoky look for day or night. It’s Charlotte’s makeup magic made easy for beginners and pros alike! Featuring cult-favorite Bar of Gold. Gild your skin in a sumptuous golden glow with Charlotte’s cult-classic Bar of Gold highlighter. Light-reflecting pigments brighten dull skin, blurring imperfections with a luminous veil of candlelight. Define and perfect your features with a cashmere-soft powder formula that buffs seamlessly into skin without patchiness or muddiness. Eye Brighten: Apply all over the surface of eyelids as a brightening primer for all-day wear. Eye Enhance: Enhance and add soft dimension to the crease and lashline. Eye Smoke: Smudge along the lashline and up into the outer corner for a dramatic smoky effect. Build up to your desired intensity. Face Bronze: Sweep along the jawline, nose, and hollows of the cheekbones to sculpt and add sun-kissed warmth. Cheek Swish: Swish across cheekbones and blend out towards the hairline for flattering radiance. Cheek Pop: Pop onto the apples of the cheeks for a bright, uplifting flush. Face Highlighter: Dust along the outer “C” of the cheekbones, down the nose, on the cupid’s bow, and in the inner corners of the eyes. All you need in one pallet! Don't get me wrong, I am a fan of Charlotte Tilbury, from skin care to their makeup line. And never had I been disappointed in their products in the past. Will process return. Loved it. 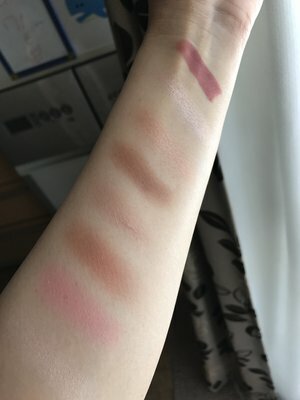 This palette would work better on a fair skin. Mine is tan olive, the blush doesn’t show up on my cheeks, but everything else did. 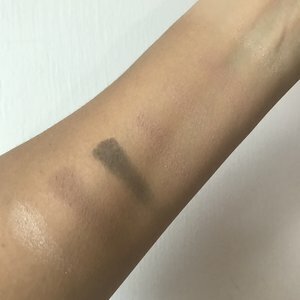 The highlighter was a bit tricky to use as I swatch it with my finger first causing the surface to become hard, like a hard wax on the top, not allowing my brush to get any pigment, I had to scratch the surface to ‘reset’ the highlighter. Very shuttle on my skin. Like I said, the palette would work better on a fair skin but I still enjoy the quality and pigments from the eyeshadow, the bronzer is divine!. I must say that this Charlotte Tilbury palette makes all the rest pale in comparison. 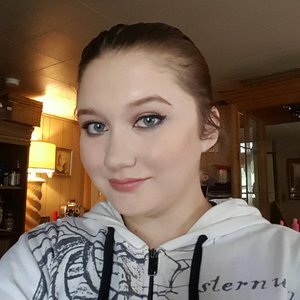 I have become a makeup addict in the past few years, watching beauty gurus on Youtube and collecting lots of palettes and products. I must say that this Charlotte Tilbury palette makes all the rest pale in comparison. 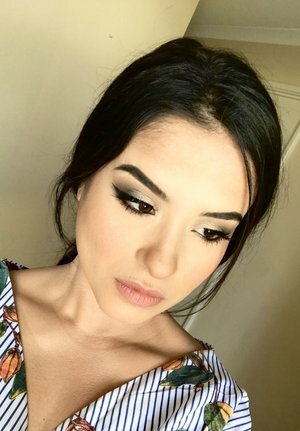 The eye shadows are the perfect basics, but what especially blows me away are the bronzer, blushes and highlighter. I'm very cautious about this kind of product, not wanting anything too glittery or greasy looking, but oh my gosh these items are perfection on me. I put them on and I feel like I look so much better even at my age (62). This needs to be a permanent palette, not limited addition. What shall I do when it's gone? This product, like all CT goodies, is exactly what it says it is- a 5 minute full face palette just in time for summer when lighter-weight makeup is preferred. No one likes a breakout from heavy makeup and sweat. I must say I'm guilty of over indulging on this purchase, as I already have the bronze & glow and a few blushes as well. My curiosity and the packaging got the better of me, for sure. I'm coming to terms with the fact I just spent $75 on 3 eyeshadows. I'm seriously over the moon for this palette, now that I have it. I've used it everyday and will continue to do so. I've decided to put the Charlotte Tilbury Magic Foundation on the shelf until the weather turns colder. I spend a ton of time outside in the sun and the lightness - both in feel and color- of the 5 minute palette is ideal for the warmer months. And although the shades are light and airy, it's very nicely pigmented without being too heavy or super sparkly. Zero disco ball effect, just be careful with the highlighter-- yes, it's so golden and glowy you will want to envelop yourself in it entirely, but please learn from my mistake and show some restraint because of that luxurious pigment. The bronzer is one that just cannot be beat, I've tried tons. I feel the bronze & glow is on the way to being a cult classic already. I lucked out with both blushes because neither are shades I already had. I'm quite sure they'd be complimentary to all skin tones. DYING over this eyeshadow trio without a doubt. The enhance shade does have some subtle shimmer but once I back away from the mirror a bit it translates into the brightening effect that I'm looking for. The smoke shade is truly buildable for a more dramatic look or keep it simple with a light wash of color in the outer socket for a bit of contrasting contour. Simply put, the Instant Look In a Palette gives you THE fresh-faced look for spring and summer, day or night, in 5 short minutes. I'd love to see a CT lip palette as well, just saying. 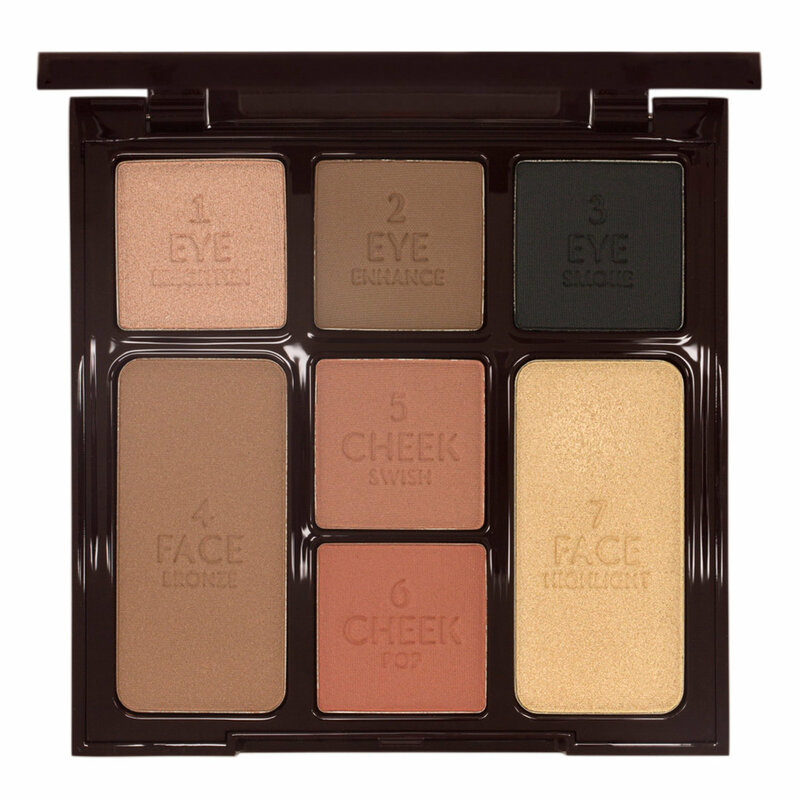 Every shade in this palette pulls together to give a naturally glowing complete look. I left off one star for the "Brighten," #1 eye shadow shade, which does not contain enough pigment for full coverage and was the only disappointment in the lot. If you have any veins that show through on the eyelid area, it just isn't enough to cover them fully, even with primer, and the texture of the shade is a bit chalky. The other two shades of e/s and the cheek products make up for this. The compact itself is a great size that packs and travels easily. I really love this palette! I am never disappointed in Charlotte Tilbury palettes. I was on the fence about purchasing another one as I have most of hers. However, It was reviewed by The Beauty Professor, and I was sold! Im glad i did as the gold highlight is beautiful as well as the eyeshadows. Equally the bronzer which is now a back up and I always need as its my favorite for my pale skin. Its just the perfect addition.